A rapid procedure was developed for the detection and identification of methicillin-resistant Staphylococcus aureus (MRSA) directly from sterile sites or mixed flora samples (e.g. nares or inguinal swabs). 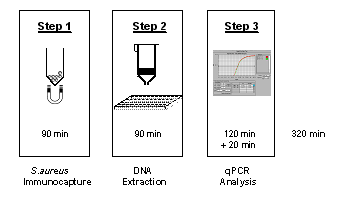 amplification/detection profile on DNA extracts using multiplex quantitative PCR. Fig. 1 : Workflow of the molecular assay (qMRSA). This assay was optimized to run either on the SDS 7700 TaqMan (Applied Biosystems®) or a random access machine (SmartCycler®, Cepheid®). femA gene from S. epidermidis. This quantitative approach allows discriminating the origin of the measured mecA signal. qPCR data are calibrated using two reference strains (methicillin-resistant S. aureus and S. epidermidis) processed in parallel to clinical samples. We prospectively tested Intensive Care Unit (ICU) patients whose 483 samples originated from four different sources (nares, inguinal, wound or pooled swabs). MRSA prevalence was 16.3% based on culture results. Compared to an optimized culture procedure including broth enrichment, molecular testing yielded a sensitivity of 81% and a specificity of 92%. 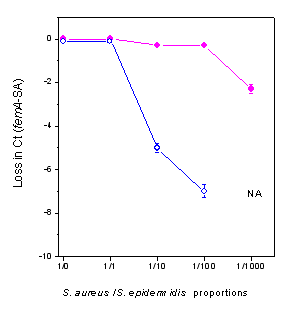 Sensitivity reached 100% when a larger fraction of the sample extract was subjected to qPCR (n=49). The complete protocol may provide results in less than 4h (while standard procedure needs 2-3 days), thus allowing prompt and cost-effective implementation of contact precautions. 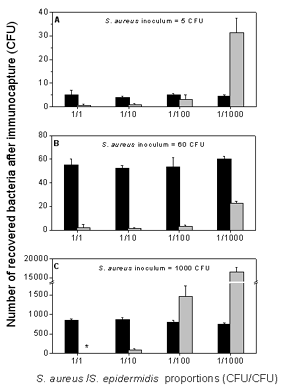 MRSA (103 CFU) was mixed with MRSE as indicated. 483 samples were prospectively collected in two ICU wards from the four following body sites: nares (193), inguinal (193), pooled swabs (69), or wounds (28). MRSA prevalence was 16.3% . Cultures were performed after a 24h enrichment in CS broth: BHI supplemented with colistin (10 µg/ml) and 2.5% NaCl. Sensitivity: In this study, only 10% of the sample extract were subjected to qPCR. When using the complete sample extract, the sensitivity increased from 81% to 100% (similar population and MRSA prevalence, n=49). Specificity: A retrospective analysis revealed that the majority of the 32/483 (8%) false positive cases were either previously known as MRSA carriers and/or were screened as MRSA culture-positive at any other sampling site during the same hospital stay. Recently, an absolute quantification assay of qMRSA was developed. The robustness of the assay was evaluated on bronchoalveolar lavage (BAL) to identify and quantify methicillin-resistant Staphylococcus aureus (MRSA) in ventilator associated pneumonia. 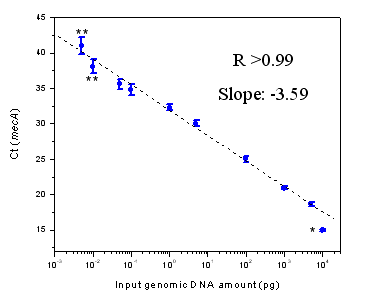 Absolute qPCR for MRSA was able to distinguish MRSA from MRSE, MSSA, MSSE based on three genes amplification profiles and detect mecA gene down to a copy number of 3 with a high degree of linear correlation (R2=0.999). Among nucleic acid extracts from BAL specimens, 19 specimens showed the presence of MRSA, 5 specimens showed MRSA and MRSE, 8 showed only MRSE, 1 showed MSSA, 3 showed MSSE and 62 samples were negative. for MRSA diagnosis, the sensitivity and specificity of absolute MRSA qPCR were 90.45% and 94.47% respectively. When using samples >100 copies/ml mecA gene as cutoff, the positive predictive value increases from 82.61% to 94.12% without significantly sacrifice the negative predictive value (97.26% to 96.20%). MRSA absolute qPCR is fast, highly sensitive, specific and quantitative assay for detection of MRSA in VAP by using mini-BAL specimens. See the poster presented by Dr. Xue-Ping Wang at the Association of Biomolecular Resource Facilities 2007 meeting or visit the website. and the presence of a S. aureus-specific femA signal that does not cross-react with other bacterial species including S. epidermidis. This novel qPCR assay allows detection and identification of MRSA in less than 4 hours with an exquisite sensitivity. Very high negative predictive values should allow the implementation of prompt and cost-effective infection control measures. A large-scale prospective comparative study was initiated in our institution to evaluate the performance of qMRSA and the impact of single-day MRSA identification (Francois et al., J. Clin. Microbiol. Jan 2003). This assay has been recently evaluated in the Geneva hospitals medical ICU and proved useful to reduce hospital-acquired infection rates (Harbarth et al., Crit Care. 2006 Feb ). Harbarth S, Masuet-Aumatell C, Schrenzel J, Francois P, Akakpo C, Renzi G, Pugin J, Ricou B, Pittet D.
Rapid detection of methicillin-resistant Staphylococcus aureus directly from sterile or nonsterile clinical samples by a new molecular assay. Francois P, Pittet D, Bento M, Pepey B, Vaudaux P, Lew D, Schrenzel J.
Download the Poster presented for the RICAI 2007 (Paris - France).